Just a few weeks ago I mentioned the “S” Curve in a post about the social media road trip — with a focus on that little plateau in the “S” curve that has proven to be a real trouble spot for many industry leaders who appeared, at one time, to be the unstoppable and way ahead of their game. The failure to fully adopt and then continue to innovate some more can lead to any industry leader being usurped by a competitor or new market entry who uses and applies technology in even more effective way thereby becoming the leader and winner in the next phase of technological and market changes. Not only is this true for business generally, it could be the point we are with adoption of social media; it is also applicable to how public relations and corporate communications professionals approach the ongoing changes impacting the profession. Just a few weeks after that post, I was honored to join the Spinsucks crew for one of their PRPro Webinars. Not only was the webinar fun I was thrilled to join one of the Masters of the public relations profession– the talented, forward-looking, strategic, and most delightful and fun, Gini Dietrich. She is also the author of SpinSucks the book. Check it out too. We dug a little deeper on a few of the continuing challenges and opportunities for growth that face both PR/Communications professionals, as well as the industry as a whole. Communications and PR Pros, We May Be in that Plateau: The last few years have seen many changes for our businesses, as well as the marketplaces where PR pros work every day – whether that be the data available to us to inform development and measure success of “messages”; the opportunities of new media and the continuing upheaval to traditional media with all kinds of implications for how we practice and even think about what traditional media relations encompasses; how we look to understand and build online and offline influencer programs; as well as just the myriad of new opportunities for PR pros to consider how and what effective public relations efforts might look like. While we might have made it through the first phase of social media, adopting to places like Twitter and Facebook or perhaps making the media relations section of the corporate website more socially savvy, the question remains, what about that plateau in the “S” curve? Many businesses adopt or innovate, but the real challenge is to keep that going, because the next wave is coming up right behind the one we think we just got through. Data and Public Information: Availability of public information (data) to both inform public relations messages; more effectively identify who it is we need to reach and determine if we successfully did; while also allowing us to fine-tune and target more effectively our program delivery – all of it will make PR more effective, measurable and with demonstrable results. The media marketplace continues to undergo phenomenal changes in its structure and the ways media is consumed. The latter impacts how we should think of the “new” media relations and the explosion of new outlets and thirst for news by the constant updating of online news sites. However, there are now a myriad of considerations for media relations once the story is published online. That online story then moves…it gets commented on — what you do about the negative comments? 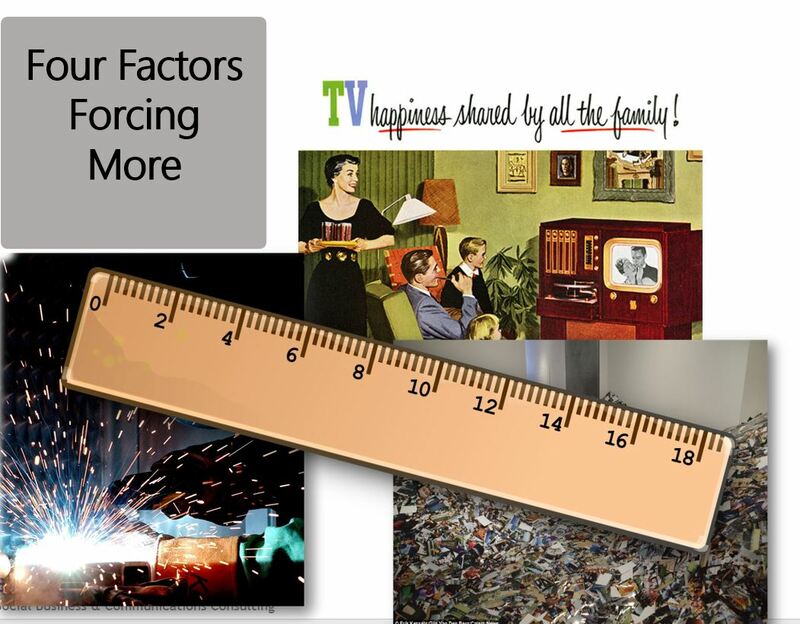 How do you measure the sharing and its impact with your influencers? How do you reinforce and connect with positive commentary and sharing? There are also new media relations practices related to the virtuous circle of “paid owned and earned.” Publishing a story is just the beginning of effective media relations…so much more comes afterwards — and it is measurable too. The Visual Web: a year ago in a presentation at a PRSA Counsellors Academy meeting, I noted that as the Web became visual, the task for communicators was straight forward– use more visuals with text and be sure to increase the use of videos. Done. A year later I take the “easy” part back. I was wrong. For example, take your messages and proof points for a company or client and see if you can put them together as a stand alone visual “package.” If you can do that then take that “package” of visuals with no words or references and show that visual package to 5 colleagues. Let me know how many of them guess, with no prodding,that “Wow!!! !this little package of pictures is our messages and proof points.” The visual Web is very complicated and our moves into the visual Web and the days of a camera in every pocket are going to require that we build a visual literacy and understanding of how to use visual communications in an effective way. While Im still working through the ideas about visual literacy for communicators, here is grist for the mill that I have been sharing here on the blog. You can follow the actual webinar presentation now posted on YouTube….and, as you will see, I did something a little different in terms of the presentation and power point slides. Hoping to make it a little fun too. A “derivative” of the actual slides is also available on slideshare. Thanks again to Gini and the team. It was so much fun I was standing on my head.